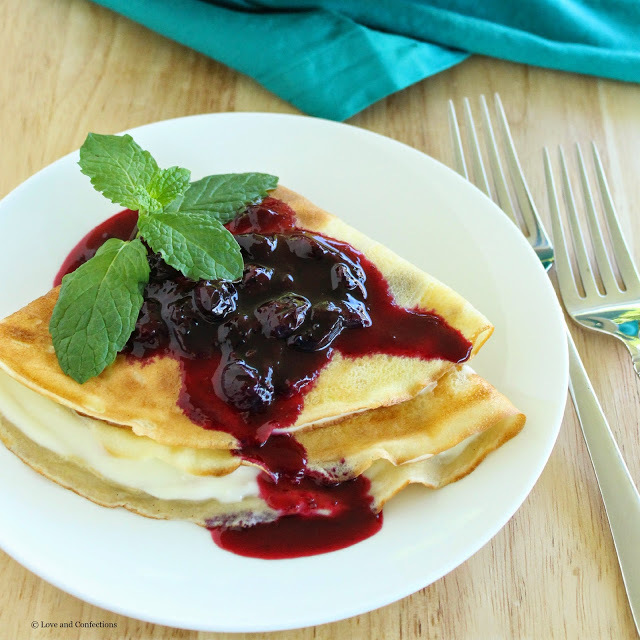 Lemon Blueberry Crepes are creamy, sweet, tart and perfect for breakfast, brunch, snack or dessert! Welcome to day 5 of #BrunchWeek that I am hosting with Shaina from Take A Bite Out Of Boca. So many delicious recipes have been shared this week and these last two days have some great ones as well. There is less than 48 hours left to enter the #BrunchWeek giveaway, so be sure you do before time is up! 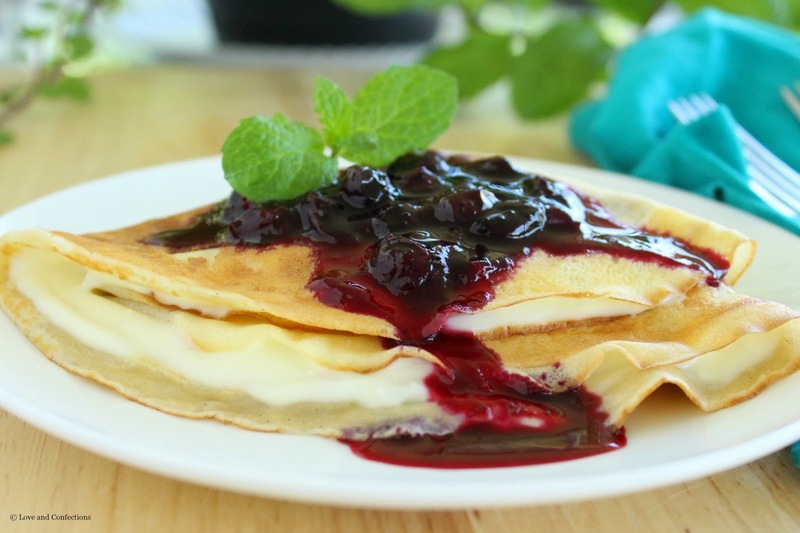 I love the bright and creamy lemon flavor and with blueberries in season here, I am using them in as many recipes as possible. If you are a regular reader, you know I love all things lemon, especially lemon curd. Making curd is so easy and homemade lemon curd tastes phenomenal. Trust me, if you haven’t made it yet, you really need to! I haven’t made crepes in a while and thought #BrunchWeek would be the perfect time. While I worked as a pastry chef in a restaurant, we would make huge batches of crepes at a time on a large, gas crepe griddle. 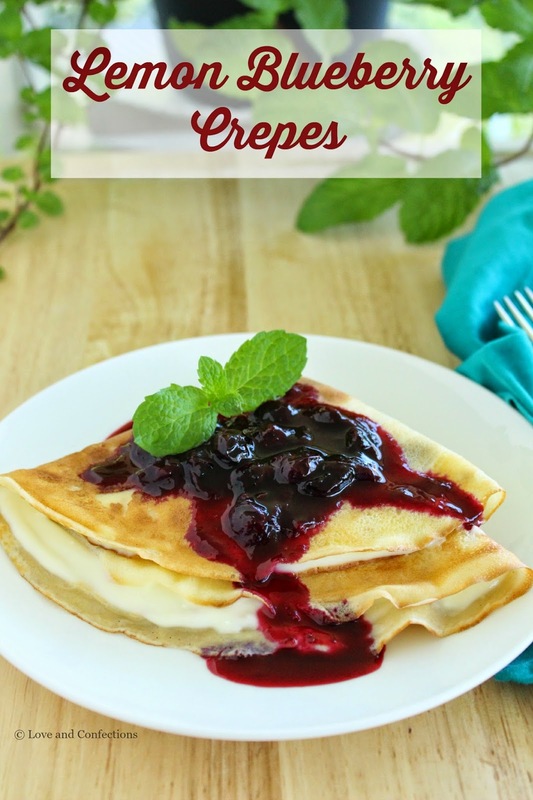 The crepes would be used for both sweet and savory dishes. I love creating all different kinds of combinations for crepes. Lemon and blueberry is a classic that I knew would be perfect just in time for Mother’s Day. I lightened the lemon curd with some yogurt. I love Stonyfield Organic Yogurt. My refrigerator is stocked full of it at the moment, because there was a huge sale at my local supermarket recently. I love their Petite Cremes flavors! Toddler L&C has been eating Stonyfield Yogurt for almost a year now, and loves it! I usually buy whole milk plain yogurt, because I can use it in both sweet and savory dishes, as well as for breakfast or snacks during the day. I love using it for parfaits with some granola and fresh, seasonal fruit. I sometimes add Nielsen-Massey Vanilla Bean Paste into our yogurt for a delicious vanilla-flecked treat. 1. In a medium saucepan, combine the Lemon Juice, Unsalted Butter and first measurement of Sugar. Whisk to combine and cook on medium to medium-high until sugar has dissolved and mixture is just simmering. 4. With a sieve, strain the curd into a clean bowl to insure no overcooked eggs get into the curd. Place plastic wrap directly onto the surface of the curd and let it cool for 30 minutes on the counter, then refrigerate it until it is thoroughly chilled. Can be made a day before use. Can be stored for up to 3 days in the refrigerator. Makes 2-3 cups. 1. Either in a blender, or in a container with an immersion blender, combine all the ingredients and blend until thoroughly mixed and there are no lumps. Chill in the refrigerator a minimum of 1 hour, preferably 2-3. 2. With either a crepe pan or large flat frying pan, spread on a small amount of Clarified Butter with a pastry brush. Using a measuring cup, pour enough batter to create a thin layer that covers the bottom of the pan. Be sure to swirl the pan, so all the batter is evenly dispersed. 3. Cook the crepe until the bottom is lightly brown, gently flip over and cook for another minute or two (less amount of time than the first side). The first crepe usually comes out bad, so don’t worry if it rips or doesn’t cook properly. 4. Once the crepe is cooked, slide it out of the pan onto some parchment paper. Continue making crepes, buttering the pan every few times, and stacking the crepes one on top of the other. If not using immediately, let them cool to room temperature, place in a zip top bag and refrigerate or freeze. Makes 12 crepes. 1. In a medium saucepan, bring the Blueberries, Lemon Juice and Honey to a boil on medium-high heat. Turn the heat down to medium and continue cooking, stirring occasionally for 3-5 minutes. Remove from heat and let it cool slightly before serving. 1. Mix 1/2 cup Lemon Curd with 1/2 cup Stonyfield Plain Yogurt and 1 teaspoon Nielsen-Massey Vanilla Bean Paste. Spread evenly between three Crepes. 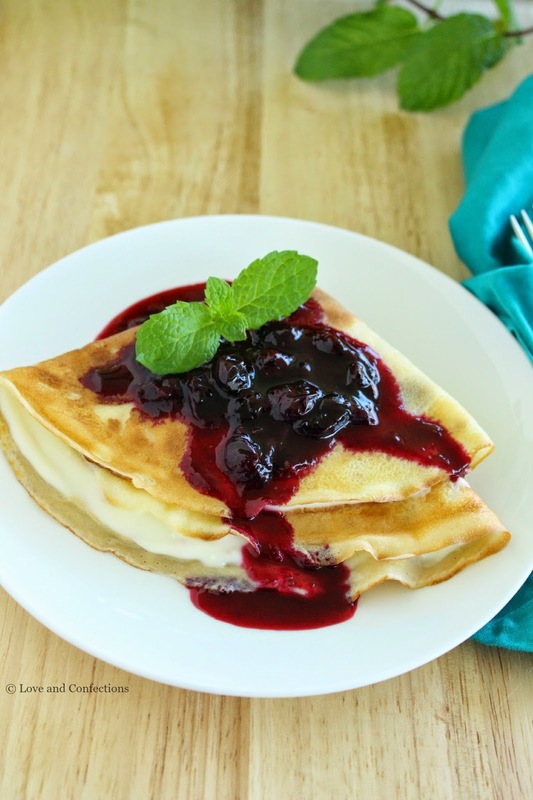 Fold the Crepes, layer on a plate and spoon the Blueberry Sauce on top. Enjoy! I hope you enjoy what the #BrunchWeek Bloggers cooked up today! Alpine Cheese Grisini from Jane’s Adventures in Dinner. Strawberry Cake from Chelsea’s Messy Apron. These are two great options for crepe-making. Oh my god, what I would give to be able to try one of these crepes…. The crepes turned out gorgeous Terri, great flavor combo! Wow what a beautiful, impressive presentation using such great spring flavors. Thanks for sharing and thanks for hosting. I love lemon curd so incredibly much, but why-ih-why have I NEVER put it into a crepe? This is a brilliant brunch option. 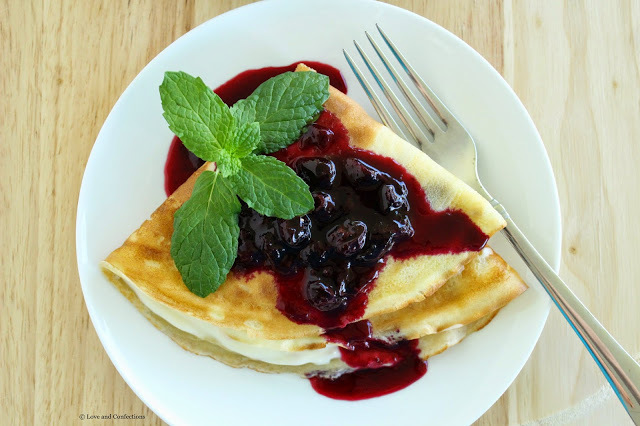 I love the idea of a tart crepe! I usually go for the traditional nutella and strawberry combo.